In your business establishment, you and your employees need to be able to focus on the task at hand. In order to facilitate this need, you should consider implementing the commercial ceiling tiles from our company. We offer excellent value on the sale of commercial ceilings. Set up a consultation with us to learn more about the benefits and physical properties of a commercial acoustic ceiling tile. Acoustical design is a complicated aspect of architecture that dramatically affects how sound waves travel inside of a room or building. Sound itself is a wave motion produced by a vibrating object. The unique layouts of rooms and the materials used in their construction are why there is no universal solution for enhancing the acoustics of a room. Everything from computer equipment and floor coverings to furniture can alter the way sound travels. When choosing commercial ceiling tiles, the designer must consider the floor plans and adjust the project accordingly. 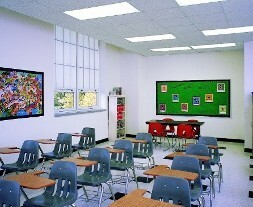 The acoustical ceiling tiles we provide are an effective way to reduce noise within a space. We supply commercial ceilings made from a variety of different materials in order to accommodate the individual needs of our clients. Some of the commercial acoustical ceilings we offer are made of fiberglass, perforated metal, and perforated wood. These products are available in a wide spectrum of colors, giving you the design flexibility to match your new ceiling with your existing interior style. Replacing the ceiling in your office is an easy and affordable way to reduce the unwanted transference of sound. Unlike metal, which can be highly reverberant, our ceiling tiles are made of an absorptive material. This ensures the sound created in a room does not reverberate and cause echoes, which can be a major problem when it comes to verbal communication. You and your colleagues will be able to understand one another much more easily with these acoustic ceiling tiles in place. You also benefit from the added privacy that our acoustic products provide for any given room. Contact us today to plan the purchase of commercial ceiling tiles for your business establishment. We serve customers throughout Maryland including Annapolis, Baltimore, Columbia, Glen Burnie,and Pasadena.